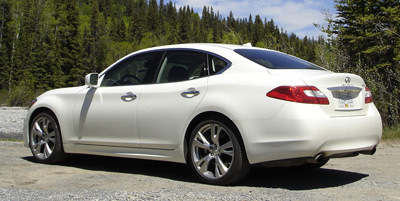 If you haven't, or even if you have and don't remember the car, they're talking about the new Infiniti M, the top-of-the-line sedan from Nissan's luxury division. It's a wonderful car, though not without its frustrations. Full disclosure: I own one of the original Infiniti Q45's, a 1991 model I bought for a song, neglected and abused and misunderstood (the car, not me! ), several years ago. I had to sink about as much into it as I paid, replacing the faulty timing chain guides for which the company should be slapped soundly for not having recalled the vehicles when the issue first surfaced, as well as upgrading the shocks and generally giving the mighty Q a new lease on life. It has been my primary personal car since then and, though it definitely feels old, I still love driving it; it handles better than a big car like that should, never loses a drop of oil, and – bottom line, considering how much cash I have into it – owes me nothing. It's a wonderful car. Since the demise of the Q45 a few years back, the M has become the spiritual successor to my mighty Q and, naturally, when a chance to review the new M came around I jumped – with gusto. The new M's body style is beautiful, with strong and attractive lines that make the rather roly poly previous generation car look plain in comparison, and I had thought it was a pretty nice car when I reviewed it. But the new M is gorgeous; in my never humble opinion it's one of the most attractive sedans on the market. If only the last generation Q45 had looked this good, instead of frumpily bizarre, maybe it would still be around. Anyway, my test M was the M56s, the V8 version of the car. The "s" denotes that the M was sporting its sportiest trim, while "56" indicates that Infiniti's V8 now displaces 5.6 liters instead of 4.5. It puts out properly prodigious poop, too: 420 horses @ at 6,000 rpm and 417 lb.-ft. of torque @ 4,400 rpm, which the company says are 95 nags and 81 torquey things more than the old V8. I'd love to try the M37, too, because the old M35's V6 was powerful enough that I wondered why anyone would actually need the V8. Don't get me wrong; the V8 is a peach and moves the car along very briskly – but with the 3.7 liter V6 cranking out 330 hp @ 7,000 rpm and 270 lb-ft of torque @ 5,200 rpm (specs that are more in line with the old 4.5 liter V8's output), I imagine it would offer all the oomph you'd need under most normal conditions, with the added advantage of lower weight and higher gas mileage. On the other hand, "need" doesn't necessarily enter into the equation, and a nice V8 can be exhilarating. This particular one performs beautifully, too, offering very smooth power and wonderful acceleration, and with a lovely growl that would be highly pleasing to the ears if it weren't for the quality of the sound insulation in the cabin. Infiniti's press materials say all M's come with a seven speed automatic transmission, with manual mode and rev-matching downshifting you can activate by large paddles mounted on the steering column. It's a nice transmission, but the paddles should be mounted on the steering wheel because it can be very hard shifting manually while you're turning the steering wheel, only to discover that the paddles haven't come with you. I know, you should have your shifting done before you enter the turn, but that isn't always practical – for example, when you're turning at an intersection after stopping at a red light. I guess the solution there is to leave it in automatic mode, but where's the fun in that? M's are available with either rear wheel drive or Infiniti’s Intelligent All-Wheel Drive system. The Sport Package with which my test unit was equipped is offered on rear wheel drive models only, and includes four-wheel Active Steer (4WAS), a sport-tuned suspension, sport brakes and 20-inch wheels and tires. Mmm, mmm good! The M's suspension carries over the previous generation’s independent double wishbone design up front and independent, multi-link keister, with stabilizer bars at both ends. Infiniti says the rear suspension geometry has been updated to provide a quieter ride. The Sport Package also includes double piston shock absorbers that "Provide a high damping force at low frequency vibrations for a flat ride and low damping force at high frequency vibrations for a smoother ride." This is all good stuff, and it helps result in the largish sedan handling quite nimbly. The "4-Wheel Active Steer" system supposedly means easier steering for the driver, as well as "Agile handling at low/medium speeds and a more stable feel at higher speeds". What it does is, depending on the speed you're driving and the angle of the steering wheel, turn the rear wheels just a tad along with the front wheels. "Infiniti Drive" is a driver-selectable four-mode throttle and transmission mapping control, activated via a little knob on the center console, that helps optimize the M's performance. The default setting emphasizes comfort over sportiness and is very nice, though I obviously preferred the sport setting – which tightens up the car very nicely, but not to the point of it being jarring by any means: this is still a luxury car. The "snow" setting is self explanatory, as is "eco". The M's cabin is laid out well and is very comfortable and luxurious. My previous benchmark in this segment (which also includes such vehicles as the BMW 5 and Mercedes E) was the Lexus GS but I like the M better – it has a warmer and more welcoming look and feel. Don't get me wrong: all of those other cars are terrific, but the M is just a nicer place to be, silver flake-embedded wood panels and all. Instrumentation is classy, very readable, and well thought out. The center stack features Infiniti's trademark analog clock, a control panel/cursor control combination that's pretty easy to use, and of course the audio and HVAC controls. The audio system of my test car was very nice, including speakers mounted right on the tops of the front seat backs. Called the Bose Studio Surround Sound system, it plays DVD-Audio discs (though not SACD's natively) and has auxiliary and USB interfaces for your portable audio device. It's definitely audiophile stuff. My test unit also had satellite radio activated. Naturally, there's Bluetooth, voice recognition and a navigation system. There are other electronic goodies, too, such as the Active Noise Control which reduces "undesirable engine harmonics, providing a quieter cabin". The M is indeed very serene, so much so that, as mentioned earlier, the peace and quiet gets in the way of enjoying the song of the mighty V8. Thank goodness there's a sunroof and windows you can open! There are more nannies, too. A Blind Spot Warning (BSW) system helps alert the driver if the car detects another vehicle in the blind spot area, a tool that's becoming quite common. What isn't as common – and thank goodness for that – is Blind Spot Intervention (BSI), which Infiniti says is a world’s first. It augments the regular blind spot warning lights by "helping the driver return the vehicle back toward the centre of the lane of travel away from the vehicle in the blind spot area", which in English means it jerks the wheel in your hands, trying to force you into compliance with its computer-judged ideal scenario. Fortunately this, like the equally annoying lane departure warning (which hollers at you if you cross a line on the road without using your signal lights), can be turned off. Alas, the lane departure system is on by default so you have to shut it off every time you decide to have a little fun and apex a curve or you'll get nagged. The aforementioned Forest Air system supposedly helps reduce the intrusion of unpleasant odors into the cabin, while providing a "more natural breeze-like airflow," which I believe means it varies the fan output based on some parameter decided by the onboard droid. I never noticed much difference, but maybe that's because I was too busy fighting with all the nannies. Another weak spot is the outside rear view mirrors, which are very big and located high enough that they can cause blind spots in front of them. Strangely, I always found the mirrors on my Q45 too small; perhaps Infiniti has overcorrected. The M's seats are very comfortable, for four people anyway, and the front ones offer heat and cooling. Naturally, there's plenty of leather, too. The seat adjustment controls are a tight reach down between the seat and the door, a complaint I also had about the G35. This is pretty minor, though. Naturally, there's a full complement of air bags and belts in case the nannies aren't enough to keep you on the straight and narrow – or the twisty and wide, for that matter. Quibbles and nannies aside, Infiniti's new M is a terrific car, and would make a nice sequel to my aging Q if I were looking to replace it. I'm not, but I'm sure tempted. 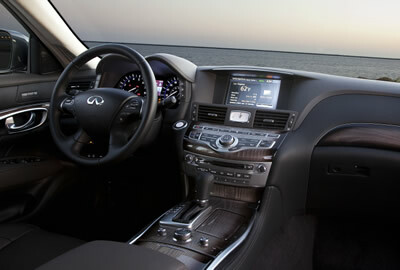 The Infiniti M37 starts at $46,250 U.S./$52,400 Canadian. The M56 starts at $57,550/$66,200 Canadian.